Fully upholstered & covered in 2 types of vegan PU leather. "EPIC Gaming Chair - Sprout Edition"
The EPIC Gaming Chair has now arrived in the new Sprout edition from noblechairs and combines PU leather with premium and sophisticated design alongside the ergonomics of a traditional office chair. A gaming chair made for enthusiasts and power users, a noblechairs gaming chair represents more than an ergonomic office chair created in the format of a racing-style car seat. Without a doubt, true fans of Sprout will be eager to get their hands on this model! Sprout, the professional German gaming organisation sponsored by Caseking and competing out of Berlin, is coached by Tobias Herberhold and features a wealth of talented young players. Their team, previously known as "Seed", now includes Danish professional Niels Christian "NaToSaphiX" Sillassen, renowned entry fragger Denis "denis" Howell and Timo "Spiidi" Richter with whom they competed at the ROG Masters EMEA Finals in Krefeld and ended up winning the $10,000 MakeMy.bet championship after beating LDLC! Sprout are also founding members of the respected eSport-Bund Deutschland, the German eSports Federation, and and look to be the hot pick for several of the highest profile eSports competitions to come over the course of 2018 and 2019. The machine-automated manufacturing enables noblechairs to use cutting-edge equipment to blend premium materials with precision craftsmanship. The steel frames of gaming chairs are welded with the help of robotic arms, similar to what one might expect to see on an automotive production line. This enables the construction of a flawless and exceptionally durable frame. The seat's cover is also tailored with the assistance of industrial sewing machines to allow noblechairs to attain the requisite perfection. 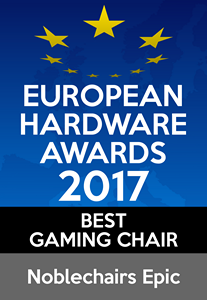 At Computex 2017 in Taipei (Taiwan) noblechairs are proud to have been crowned the winner of the "Best Gaming Chair" category thanks to the prestigious European Hardware Association for the noblechairs EPIC Series. This award and the rest of the award-winning recipients can be viewed here. Caseking would like to extend our congratulations to noblechairs on this well-deserved victory! The noblechairs EPIC Gaming Chair, available here in the Sprout Edition with its green-black design that includes the "Sprout" logo of the elite gaming clan, and comes covered in a vegan PU leather covering. The combination of porous cold foam and the premium covering helps to keep you from breaking a sweat amidst even the most heated of online battles. The green stitching on the seams and the backrest was made possible with the help of industrial sewing machines and makes for an elegant addition to the black-green PU leather. A robust, oval-shaped aluminium plaque in black comes with the white noblechairs logo at shoulder height and the reverse of the chair also comes adorned with the stylish "Sprout" logo to round out the design of the chair. The cushioning of this chair consists of deformation-resistant cold foam with an exceptionally high 55% density. The breathable cold foam improves airflow while simultaneously maintaining its form, even over long periods of use. Standing in stark contrast to competing gaming chairs, noblechairs offers a solid steel frame ensconced within the upholstery. Aside from the improved breathability of noblechairs' EPIC series, they also offer a multitude of ergonomic adjustment options, meaning that once you've sat down you won't be in a hurry to get up again. As a result, noblechairs EPIC gaming chairs also allow the height to be adjusted by 10cm. In conjunction with the adjustable rocking mechanism that enables the backrest of the seat to find the ideal ergonomic sitting position, the end result is a chair that makes sure nothing gets in the way of gaming! The 4D armrests of noblechairs are adjustable in four dimensions, making it possible for anyone to find the perfect sitting position. The high backrest can be adjusted to an angle of 135° and the cushions bundled with the chair add an ergonomic and aesthetic flourish to the chair. The small cushion supports the neck and the large cushion supports the lumbar region. The elastic supports the lumbar region. The elastic straps on the cushion enable the cushion to be firmly attached to the chair and the height customised in accordance to the precise needs of the user. The base of the gaming chair from noblechairs is formed from a five-point powder-coated base consisting of solid aluminium as well as five 60mm casters with nylon cores that make them equally at home on hard- and soft flooring. The Safety Class 4 gas lift is designed to support up to 180kg. These premium chairs deliver, without a shadow of a doubt, a sublime seated experience straight out of the box, and the only way this could be improved upon is with the help of premium accessories developed by noblechairs themselves. In order to adjust the gaming chair to perfectly fit the requirements of the user, noblechairs offers practical 60mm hard floor casters with automatic brakes, which bring to an end any unwanted forwards or backwards sliding during use. Additionally, shorter gas lifts enable a reduction in the total height of the seat, thereby enabling optimal comfort for smaller users. Take it to the Next Level with a noblechairs Footrest! Build on the premium comfort of noblechairs by investing in ergonomic accessories, not just a sensible addition but an active measure against poor posture in the long term. With the noblechairs footrest the team has developed an accessory that maximises not just comfort, but is also perfect for your back and posture generally. The premium crafted materials and their elegant design perfectly complement the accessories. More links for "EPIC Gaming Chair - Sprout Edition"
thanks ocuk for fast delivery, i'm happy to be supporting my favourite team in the uk!